If you missed the glorious offerings of the 2011 Good Food & Wine Show in Melbourne recently, never fear! This food-show extraordinaire is making its way up to Sydney, Perth, Adelaide and Brisbane in the next few months. In the meantime, try your hand at this warm, spicy laksa from The Food Book (p. 247) — inspired by Poh Ling Yeow’s Malaysian segment at the Melbourne 2011 GFW show. There are many types of this popular Malaysian dish, but the most common is the coconut-rich curry laksa. Some say ‘laksa’ comes from the Sanskrit lakh (meaning 10,000), referring to the many ingredients used to make it. You can use various noodles – from very thin vermicelli to thick udon. With Autumn upon us, Food Book author Anne Prescott raids her garden for some seasonal inspiration to share! Depending on your climatic zone you are likely to have an excess of smaller cherry style tomatoes in your school, community or home vegetable plot at some time of the year. While you can swap or give these tomatoes away there is still often an excess. These tomatoes can be quickly made into a fresh tomato sauce suitable for pizzas or served with pasta, vegetable or meat dishes. This sauce freezes well, and would be perfect for a school or community pizza night later on in the year. BBQ season has arrived… Free recipe! 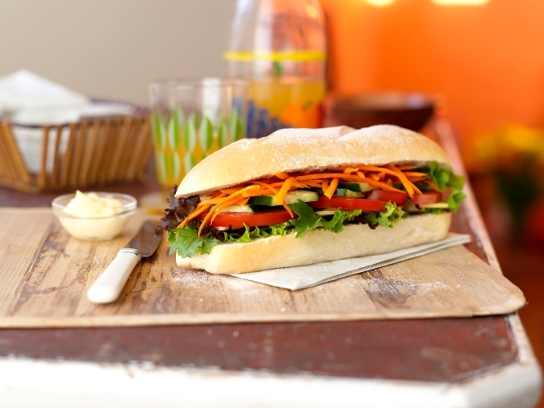 Barbeque season is finally here and ’tis the season for eating outdoors! The Food Book has a dedicated barbeques section, although many of these recipes can also be cooked inside using a grill pan or similar. 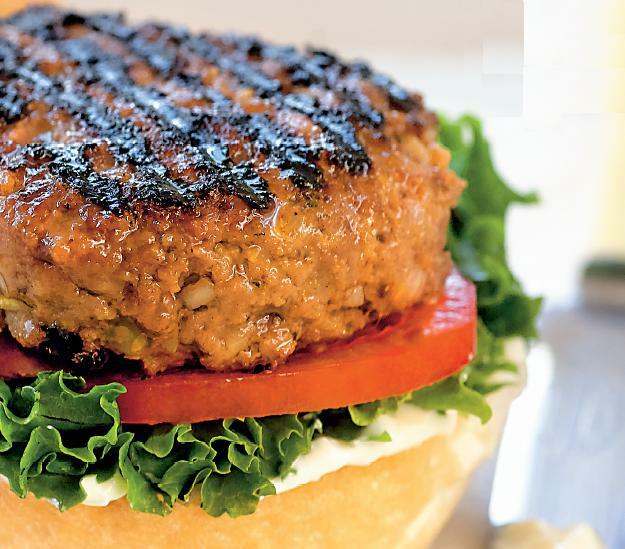 These lamb burgers from page 303 of The Food Book are delicious in a bread roll with lettuce, tomato, cucumber, feta and tzatziki dip. 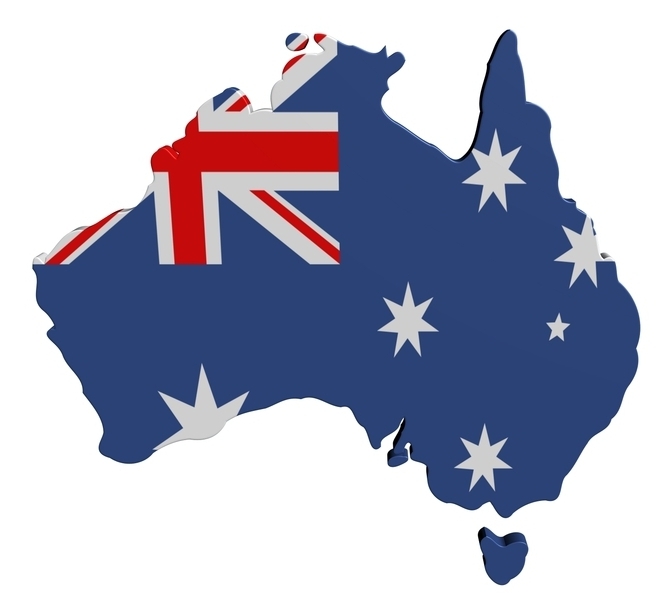 Working our way around Australia with The Food Book professional support workshops and various conferences, many teachers have asked us about Indigenous Australian recipes in The Food Book. We are always pleased to be asked this question because the answer is yes, The Food Book includes many recipes that include some of our beautiful native ingredients. 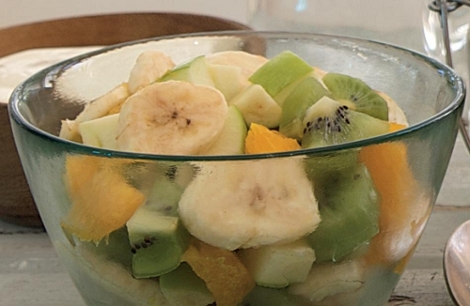 Here is one such recipe to whet your appetite. July 14 marks the French national holiday, Bastille Day and what better way to celebrate than with some French cooking! 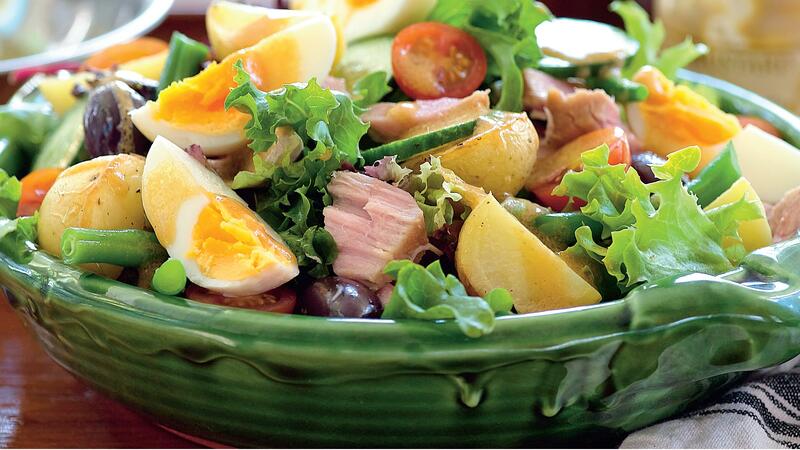 Niçoise salad is a substantial salad originating from the French city of Nice. Traditionally, the potatoes are simply steamed or boiled but in this recipe from The Food Book they are roasted for added oomph. The key ingredient is just-seared tuna but you can make a quicker version with a smoked trout fillet or a 425g can of tuna. In celebration of the first week of winter we hope you enjoy this free excerpt from the soups section of The Food Book. 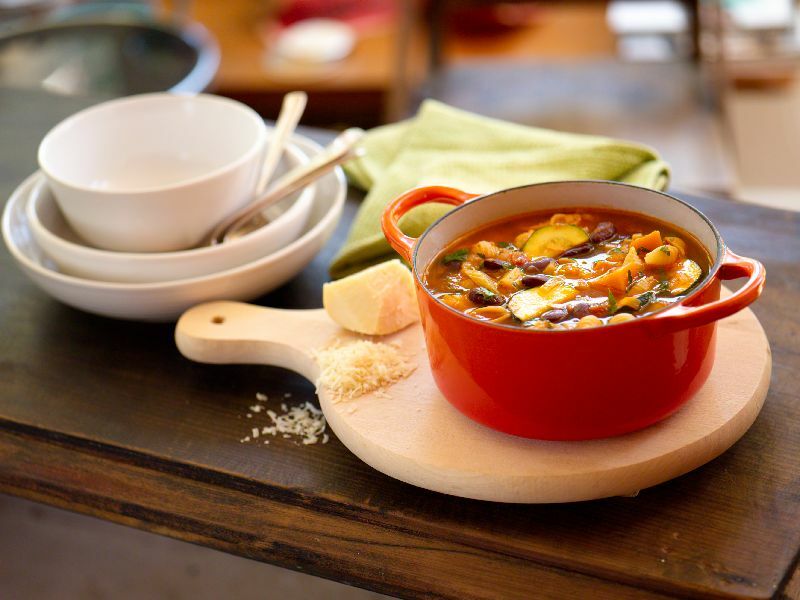 Literally meaning ‘the big soup’ in Italian, minestrone is a hearty stew-like soup made from vegetables, dried beans and pasta. A range of beans can be substituted for kidney beans, including cannellini, lima and borlotti.